Nothing heralds the coming of summer in Los Angeles quite like the bloom of our jacaranda trees. 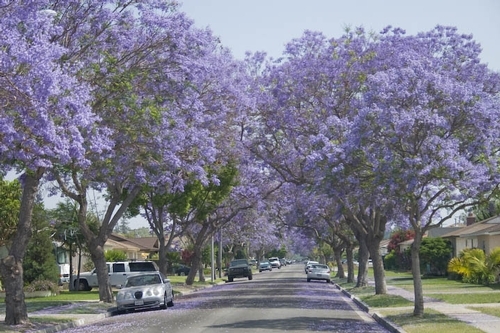 Jacarandas produce loads of incredible purple flowers in May and June, with trees lining entire streets in some parts of town. Our in-house tree expert at UC Cooperative Extension, Environmental Horticulture Advisor Donald Hodel, likes jacarandas not only because of their flowers, but also because they have a nice canopy—lacy, airy, and not too dense-which lets light through and makes it possible to grow other plants underneath. Don shared some suggestions for anyone who might be considering a jacaranda as part of their landscape.Jacarandas require adequate space. Keep in mind that they will grow 30 feet tall and up to 30 feet wide. When in bloom, the trees drop lots of flowers which can stain patios, cars, and even carpets if they are tracked into the house. It’s best to plant jacarandas where they can drop their flowers on lawns or groundcover. Jacarandas tend to produce water sprouts, vigorous upright shoots that grow straight up out of the branches. These should be thinned out if possible because they damage overall branch structure of the tree and are often weakly attached. Once established, jacarandas can get by on winter rain, but need to be irrigated during summer and fall. For established trees, it’s best to withhold water and fertilizer in the winter because this will ensure more flowers in the spring. Jacarandas are a South American tree, native to Argentina, and belong to the trumpet vine family along with other flowering trees such as Catalpa and Paulownia. Click to learn more about Don Hodel and his research on urban trees.